nuffnang ads – Have you seen them around? Like all money-eyed $$_$$ bloggers, I waited and anticipated nuffnang ads to hit my blogs. So, when it does, I took a screenshot of them. In case you do not sign up with nuffnang and are not sure how it looks, here’s a sample of the banner ad from my parenting site MyMomsBest. 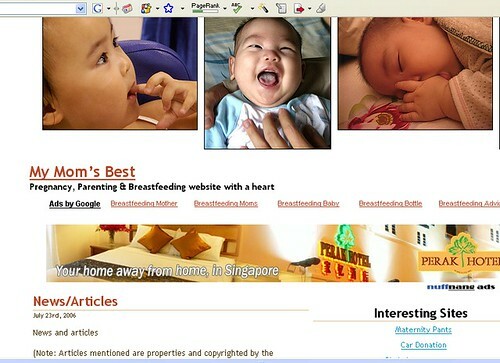 The photos of the babies is my blog banner followed by Google Adsense links and then nuffnang ads for Perak Lodge, a hotel in Singapore. You can see the ads and the title and part of my blog content within the full monitor screen. So, I would say the ad fits in very nicely and pretty too. I also have the skyscrapper ad for another company – Exabtyes on my sidebar. So, do you have nuffnang local Malaysian ads served on your site yet? If you haven’t sign up, hurry up and be the first batch to grab the opportunity. I have seen many new bloggers on blogspot getting their ads too. Â So, if your blog has decent traffic and with good placement of the advertisement spots, then, you have a good chance of getting the ads. I already seen them on my blog. Any dea how they pay? Thru bankin, cheque, paypal ? ?